Somewhere around 2010 I decided it was time to get the AC in my 1963 Galaxie 500 charged up for the summer. $100 later it was ice cold and working like a dream, I was a happy camper. A month after that I flick the switch and wait for the refreshing cool air… it never got cool. I was not a happy camper. What could I really expect? The 1963 AC system to be still fully functional? My expectations were high apparently. The compressor was leaking out of both ends, badly. So I decided that one of these days I’d get a new compressor and the system would be good to go again. Somewhere around that same time I noticed that on any reasonably hot day, as soon as you got under 30 mph, the temp gauge would just climb. A new bigger badder, 6 blade agressive fan and a partial should were added to the car along with a new radiator cap after the old one blew a seal. It helped, a bit, the car was still running hot in stop and go traffic and it was still slowly creeping up at low speeds. A trip to a friend’s garage revealed that the radiator was only cooling 5 degrees from inlet to outlet, it was apparently partially plugged. So last September I ordered up a Speedway Universal Ford Aluminum Radiator…. and it sat in my living room until I had time to tackle the job of replacing the old one. But the domino that started this chain of events was neither of these. On the way home from Jeff Myers’ Premier Body & Paint in Arkansas City, KS I noticed that the generator light was on. A couple of quick checks told me the generator was not doing it’s job. Since I had plans on installing a nice sound system in the Galaxie eventually I decided to upgrade to a Tuff Stuff 1 wire alternator. So about a month before my planned trip to the Lonestar Roundup I took the car out to my Dad’s heated garage for what we both envisioned as a weekend long job. You know what happened next. The Domino Effect took hold. While test fitting the radiator, we figured out that this universal radiator was nice, but it just didn’t fit. The bottom connection on the radiator was exactly where the power steering pump pulley was wanting to be. Sure it could be cut and rewelded and such but there just isn’t time for someone like me to learn how to TIG weld. A friend or two offered to help but they live an hour trip away and there just hasn’t been time to get it done. Add to that a new Champion Radiator is fairly inexpensive and a direct replacement to the original and it was time to order a new one. Okay, so I’ll set this radiator aside for a future project and get a Champion direct drop in radiator, no problem this is going to go fine. It was just about the time we said that when Dad noticed the shaft of the power steering pump looked a bit odd. It was shiny right in front of the front bearing. He grabbed the pulley and gave it a little push, it wobbled…badly. The power steering pump which was 3 or so years old was shot. After some online research I see a lot of people complaining that even after a rebuild this style of pump could fail fairly quickly. Many suggested upgrading to the venerable Saginaw pump… yup a GM part on my Ford, heresy. The alternator is also a GM 1 wire! Right about here the domino effect starts picking up steam. The saginaw pump won’t work with the factory power steering pump bracket. The alternator requires new brackets as well. These brackets are built for a 65 or newer water pump… I have a 63. Okay so while I’m at it, a new high flow water pump will be ordered too. If I’m going to do this, it’s going to be done right and once. A little digging on the website of the company that builds the brackets shows that they also sell one for a sanderson style AC compressor for the Ford FE. Well since I’m doing it, I’m gonna do the damn thing all the way, ordered that bracket too and a new Sanderson AC compressor after a conference with a mechanic friend that assured me that it would work with the rest of my system. 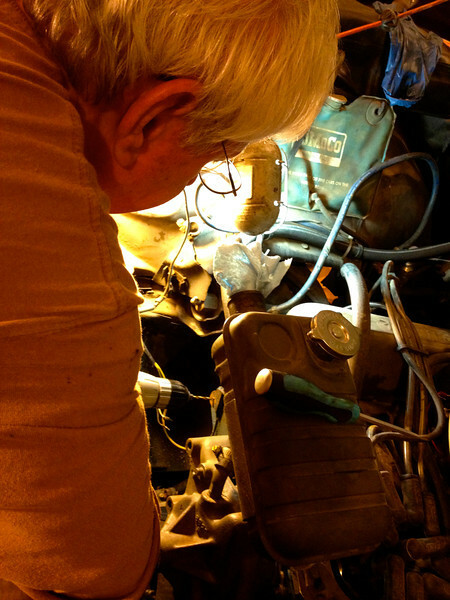 Dad elbow deep in my Galaxie, thanks for your help Pop! So all of the parts were ordered, all the brackets were ordered, it was sit and wait for the Santa in the brown truck to bring all the goodies to my door. Everything showed up and it was time to head back to the garage to start putting this thing back together. Next up comes the fun part! That’s it for the lead up, tomorrow the tale of how it all went together. Next PostNext This weekend is Viva!